17-year cicadas: Red eyed and noisy | The Southern Home Bestuary: Living with our critter friends and enimies. The 17-year cicada showing its distinctive red eyes. 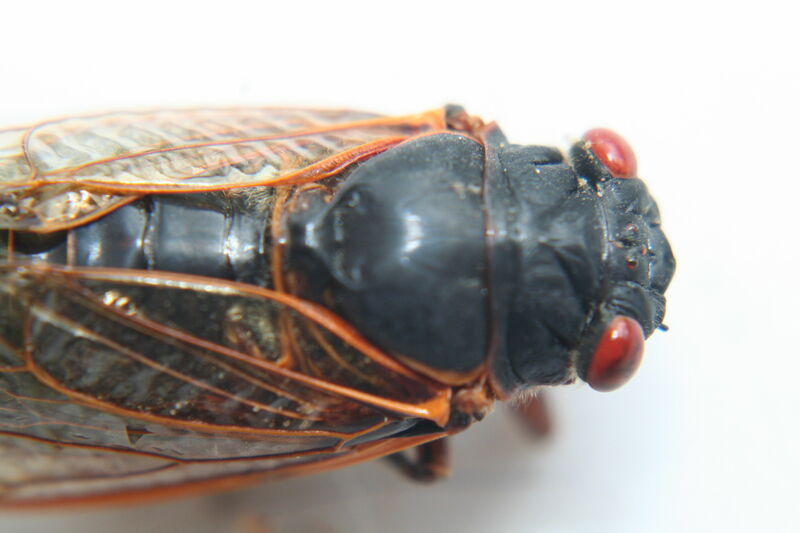 From the Piedmont of Virginia through the Carolinas into Georgia and on west to Arkansas, Brood 19 of the 17-year cicadas are emerging by the millions for their brief above-ground stay. For about two weeks they sing their “hearts” out. Actually they do not sing with their hearts, but once the southern woods warm up they put out an almost mechanical-sounding buzz, like a piece of heavy machinery, that can reach a noise level of 100 decibel. Seldom does only one sing. More often it is thousands of them that get cranked up in their enthusiastic efforts to attract a willing mate. The numbers of these insects can be staggering, with up to 1.5 million per acre. 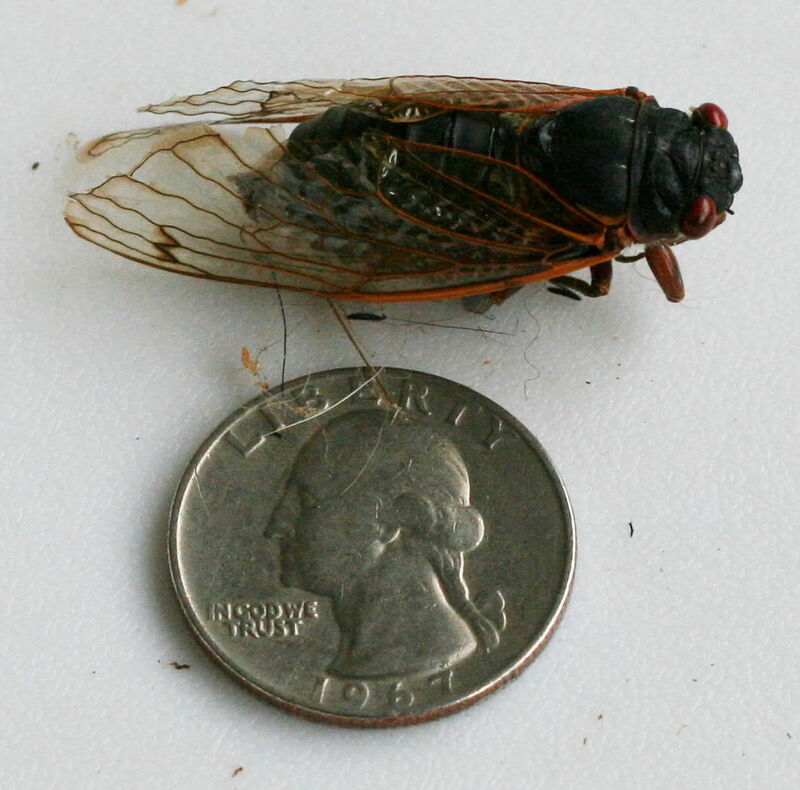 17-year cicadas with 25-cent coin for scale. They emerge, climb a vertical surface and then molt. Initially they are ghostly white but ultimately harden into darker brown and yellow hews. The distinctive red eyes distinguish these from the common, or annual, cicadas. They may feed extensively enough to damage young shrubs, but mature trees are almost always able to withstand even heavy feeding without damage. Wild turkey’s enthusiastically feed on this bounty of free crunchy protein, as do many small mammals. Although big and noisy, their mouth parts are not suitable for biting. The enormous numbers of them insure that a sufficient number will survive to bring on the next brood. Once mating takes place, eggs are laid, pupate and then fall to the ground where they spend the next 16 years about a foot below ground feeding from juices extracted from plant roots.